The House of Representatives ad-hoc committee on Emergency and Disaster Preparedness yesterday offered insight into why it indicted Vice President Yemi Osinbajo on the alleged diversion of N5.8 billion meant for emergency intervention in the north east. 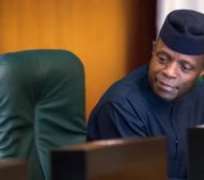 The Chairman of the committee, Mr. Ali Isa J.C., who addressed reporters at the National Assembly Complex in Abuja, explained that there was no way Osinbajo could be exonerated from the alleged mismanagement of the fund. To justify his position, he brandished a memo (reference number SH/OVP/DCOS/HMF/010), dated June 1, 2017, which drew the attention of the former finance minister, Mrs. Kemi Adeosun, to an approval for the purchase of 30,905,08 metric tonnes of grains worth N5,036,644,933.26 and the cost for logistics and distribution of the grains put at N829,026,456. The lawmaker also brandished another memo (HMF/FMF/CBN/FOOD/1/2017) dated June 2, 2017, in which Central Bank Governor, Mr. Godwin Emefiele, drew the attention of Adeosun, Osinbajo and the Accountant General of the Federation Ahmed Idris to the payment instruction for the aforementioned amount of money. He further claimed that in breach of laid down procedure, the money was paid directly to five companies: Dangote Rice Limited (N936.1 million); Golden Agric Input Limited (N1.3 billion); BUA Rice Limited (N1.3bn); WACOT Limited (N453.6 million); and WACOT Limited (N939.9 million) while NEMA received N829 million for the transportation of the goods. Isa, who insisted the report was not politically motivated, urged anti-graft agencies not to shirk their responsibilities by bringing to book anyone found wanting in the alleged theft. In a report adopted last week, the House had indicted top government functionaries involved in the approval, processing, release and diversion of the money on the ground that they contravened the provisions of Section 80 (2) of the 1999 Constitution as amended. The statement reads in part: “These presidential approvals were well within the clear constitutional authority of the acting president, who needed to take emergency steps to forestall acute food shortages in the affected states and there was nothing illegal or unconstitutional about them. The approvals were duly communicated by the Deputy Chief of Staff to the Central Bank Governor, Director General of NEMA and the Minister of Finance for implementation. “On account of the emergency nature of the procurement, the House committee's assumption that the ordinary rules of procurement would apply was wrong. Section 43 of the Public Procurement Act makes provision for emergency procurement, in which case the procuring entity is allowed to engage in direct contracting for goods and file a report thereafter with the Bureau of Public Procurement. “It is also wrong to assume that taxes and interests accruable to government from these transactions in food items were deliberately ignored or waived by neglect. Of course, we expect that any loans advanced to any of the companies would be recovered with the agreed interests, and that any profits made by such companies would be liable to tax in the usual manner. “The suggestion that the grains were never delivered to the target states is also blatant falsehood. In actual fact, in order to ensure effective distribution of the grains, an Emergency Food Intervention Project Team was established, consisting of the Director General of NEMA and representatives of the National Security Adviser, Chief of Defence Staff, Chief of Army Staff, Chief of Naval Staff, Chief of Air Staff, Department of State Security, Nigeria Police and the Presidency. “The committee also worked with respective State Emergency Management Agencies, as well as humanitarian agencies such as World Food Programme, International Committee of the Red Cross, and the United Nations Office for the Coordination of Humanitarian Affairs. Deliveries were publicly made directly to the intended beneficiaries. “In fact, the then acting president personally inspected the electronic truck-tracking unit established in Maiduguri for the purpose of monitoring the transportation and flagged off the food distribution on June 8, 2017. Besides, there was the integration of a robust monitoring and evaluation system into the operation, in order to facilitate a transparent and accountable process. In another development, Mr. Nasiru Ingawa, a one-time special adviser to former governor Ibrahim Shema of Katsina State on SURE-P, yesterday told a Federal High Court in Katsina how Shema allegedly directed him to use about N5.7 billion state SURE-P (Subsidy Reinvestment and Empowerment Programme) funds for politics during his tenure.